Even while all this is happening, the young male slaves of Mathom Hall are forging their own future and looking to reopen the old male slaves’ wing at the Hall and return it to its former glory. Meanwhile, around the world, the Forces of the Line are gathering for an offensive against their enemies and the War of the Goddess is mounting towards a decisive climax. 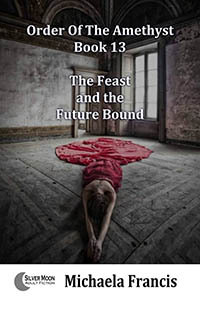 The thirteenth episode of Michaela Francis’ epic saga carries the reader relentlessly forward, amid the bizarre and entrancing world of Mathomdale, exposes deep secrets of the Line of the Goddess and begins to unveil a dazzling and disturbing future.